Hazardous road conditions that are often manageable to larger passenger vehicles can pose a great danger to motorcyclists. Due to the lack of protection that a motorcycle offers its rider, the smallest road hazard can cause an accident that results in severe injuries or death. That’s when you need an experienced auto accident attorney in Tulsa to seek you the justice you deserve. 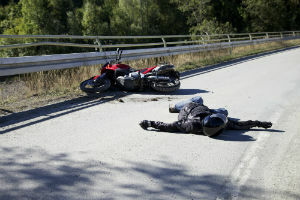 To stay safe, motorcyclists must be aware of common road hazards to avoid being in an accident. Abnormal road textures: Roads with rough or uneven surfaces pose a danger to motorcyclists. Bumps, potholes, rough textures and even construction projects such as road resurfacing can cause the rider to lose balance or control of the motorcycle. Gravel: Gravel can be hard to spot and avoid when riding a motorcycle, especially around a corner. Motorcyclists most often encounter gravel on winding roads that are popular with bikers and require focus and concentration. Edge breaks: When opposite lanes of traffic are at different heights, it is called an edge break. Traveling over an edge break can pose a danger to a motorcyclist if he or she does not have the skills to navigate such conditions. Open bridge joints: When traveling over bridges, there may be gaps, called open bridge joints, which hold bridge sections together. Some may be wide and are difficult for motorcyclists to navigate around. Expansion joints: Sections of road may be held together by expansion joints, which let the roadway expand or contract, preventing cracks. This often creates an uneven surface in the road that may become slick when wet, making it dangerous for motorcycles. A poorly maintained road can lead to an accident that results in severe injuries or death. If you have been injured or lost someone you love in a motorcycle accident due to a poorly maintained or neglected road, you may have a case against the state, county, city or business who is responsible for the road. Our experienced motorcycle accident lawyers will provide you with a free consultation to help you file a claim and discuss if you are entitled to damages for lost wages, medical bills, and pain and suffering. We work on a contingency fee basis and will not charge you any legal fees unless we help you recover compensation. Schedule your free consultation today.